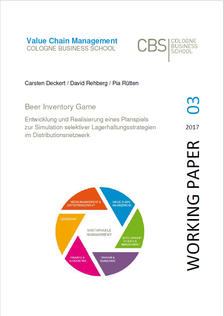 Diese Seite gibt einen Überblick über meine Beiträge zur CBS-Working Paper Series (ISSN 2195-6618). Mit dieser Publikationsserie verfolgt die Cologne Business School (CBS) das Ziel, die Forschungsergebnisse der CBS einem breiten Fachpublikum zugänglich zu machen. This working paper addresses the issue of cross-cultural innovation and asks how companies can adapt successfully to culturally different markets in the design of their product. The focus is on the physical product characteristics such as color, size, flavor, and form that vary across cultures and where the culturally different preferences for and meanings of these features are an important factor in marketing and sales of the products. 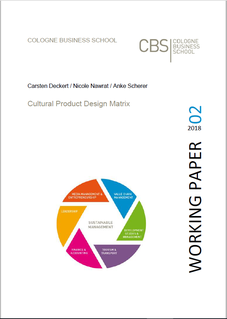 After a general introduction about the influence of culture on production design, the article presents the Cultural Product Design Matrix that serves to guide the product development process in a way that avoids cultural blunders and leads to the creation of products that are culturally adequate in foreign markets. This matrix is then applied to several case studies from the consumer goods industry, in particular the beauty and home care sector, to test its usability as an instrument that can help producers to hedge against culture-related problems in the conception and launch of their products in new markets. der Distributionsstruktur hat Auswirkungen auf den Lieferservice und die Kosten (Standort-, Bestands- und Transportkosten), die im Planspiel simuliert werden können. Dabei werden insbesondere Aspekte der zentralen und dezentralen Lagerung sowie der Bestandsbündelung und des Sicherheitsbestandes vermittelt. Das Planspiel wurde in MS Excel umgesetzt und in zwei Kursen getestet – in einem Bachelor- und einem MBA-Kurs. Trotz der geringen Komplexität wurde eine vertiefte Lernerfahrung der Studierenden erzielt, die sich durch das selbsttätige Ausprobieren und den Spielspaß bei der Lösungssuche ergab. Creativity in inventive problem solving usually takes place in the middle of the continuum of sheer chance and safe bet. Inventors normally use creative heuristics which provide them with promising search fields and directions for inventive problems. The paper at hand analyzes the existing frameworks of heuristic principles described in scientific literature about invention and insight, and proposes a framework of creative heuristics. Furthermore existing heuristics from invention and insight research are allocated to the principles in the framework. Thus, the proposed framework of creative heuristics can be used as a toolbox in creative or inventive problem solving and as a means to promote creativity in engineering education. The standard definition of creativity is based on a tension between originality and effectiveness. The paper explores how this tension pervades the functional creativity of creative products. To achieve this, the so called value square (“Wertequadrat”) developed by Helwig (1967) and Schulz von Thun (1998) is used. The value square balances a value with its countervalue. The author identifies two tensions – the tension concerning style and novelty and the tension concerning resolution and novelty – which both represent the tension between effectiveness and originality of the standard definition. Furthermore a tension within effectiveness is identified – a tension concerning style and resolution. The implications of these tensions on product design are discussed and as a conclusion a dilemma of customer insight is developed. Das Paper beschreibt die Planung und Entwicklung eines Unternehmensplanspiels zur Simulation eines Kommissionierbereichs. Lernziel des Spiels ist die grundsätzliche Vermittlung sowohl von praktischer Methodenkompetenz als auch von Sozialkompetenz. Im Rahmen der Methodenkompetenz werden Grundwerkzeuge der Logistik wie beispielsweise die ABC-Analyse geübt und grundsätzliche logistische Denkweisen geschult. Dadurch dass die Teilnehmer während des Spiels in unterschiedliche Rollen schlüpfen und dass die Lösungen durch die Teilnehmer im Rahmen von Teamdiskussionen selbst gefunden werden sollen, soll ebenfalls die Sozialkompetenz gestärkt werden. The definition of individual creativity is based on a tension between novelty on the one side and usefulness respectively appropriateness on the other side. The paper explores how this tension pervades the stage and componential theories of creativity. 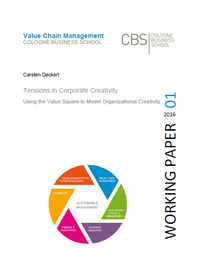 To achieve this, the so called value square (“Wertequadrat”) developed by Helwig (1967) and Schulz von Thun (1998) is used which balances a value with its countervalue to analyze creativity. The author identifies tensions of action and inaction, expertise and mindfulness, precision and ambiguity as well as immersion and detachment permeating the creative process and the components of creativity. As a conclusion a morphological box for creativity is presented which allows one to show which combination of characteristics of the tensions support different stages of creativity. Furthermore implications for development and time management are discussed. The working paper at hand assumes that differences of innovativeness of different countries can be explained to a certain extent by cultural differences. Thus, the paper deals with the research question of which cultural dimensions have an influence on national innovativeness. Previous research mainly uses the Hofstede-dimensions to describe cultural differences and often focuses on single parameters to describe national innovativeness (e.g. number of patents per capita). This paper, instead, uses the dimensions of the GLOBE-study which builds on the findings of Hofstede but is more up-to-date and comprehensive and uses two innovation indexes – the Global Innovation Index (GII) and the Innovation Union Scoreboard (IUS) – to describe national innovativeness. The authors use correlation analysis to find relationships between the GLOBE dimensions and the innovation indexes. They find positive correlations of innovativeness (both indexes) to Future Orientation (practice scale), Gender Egalitarianism (value scale), Human Orientation (value scale) and Uncertainty Avoidance (practice scale) as well as negative correlations to In-Group Collectivism (practice scale), Future Orientation (value scale) and Uncertainty Avoidance (value scale). Some of the findings are contrary to existing hypotheses, e.g. only a weak negative correlation of Power Distance to one of the indexes. Furthermore the findings show significant differences between practice scales and value scales, especially concerning Future Orientation and Uncertainty Avoidance which deserve further examination. Overall it can be concluded that culture has an impact on national innovativeness. The different cultural dimensions of the GLOBE-study show a multi-faceted interrelationship between culture and innovation. To come to a concise answer for the question which dimensions affect national innovativeness in which way additional research will be necessary. 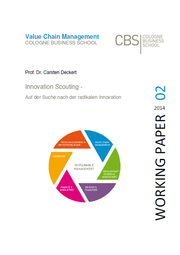 Veränderte wirtschaftliche Rahmenbedingungen und die zunehmende Bedeutung von radikalen Innovationen und technologischen Diskontinuitäten führen dazu, dass mehr und mehr Unternehmen Scouting-Aktivitäten implementieren. Diese gehen über das klassische Innovationsmanagement hinaus. Im vorliegenden Beitrag werden Auswirkungen dieses Scouting Paradigmas diskutiert und ein Framework zu dessen Umsetzung entwickelt, das sowohl den Blick nach außen als auch nach innen richtet. External Innovation Scouting dient dazu, systematisch Technologien und Geschäftsideen als Innovationschancen für das Unternehmen zu ermitteln. Beim Internal Innovation Scouting geht es darum, die richtigen Rahmenbedingungen dafür zu schaffen, dass Mitarbeiter Innovationschancen aufgreifen und im Unternehmen radikale Innovationen marktreif entwickeln können. Außerdem stellt das Innovation Scouting neue Anforderungen an die Innovationsbewertung. Innovation Scouting ergänzt das bestehende Innovationsmanagement um eine langfristige Perspektive, die für das Überleben jenseits der Quartalsberichte von entscheidender Bedeutung sein kann.